Oliver Naesen (AG2R La Mondiale) finished the Vuelta a Andalucia/Ruta del Sol with a broken nose but this will not stop him from continuing the season as planned. 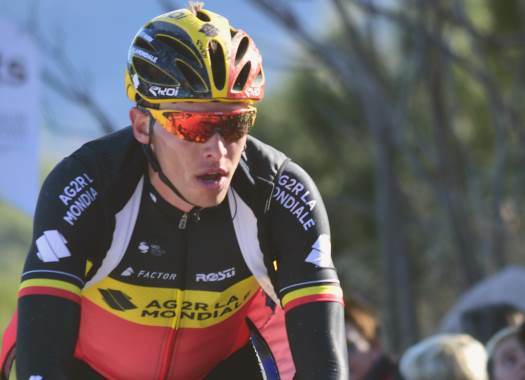 The Belgian champion couldn't avoid a crash at the penultimate stage of the Spanish race and hit the ground hard with his nose. That day AG2R La Mondiale already announced that the rider was finishing the race. Naesen went to the hospital due to the persistent pain and there it was confirmed that his nose was broken. "This is annoying, but I will not ride one kilometre per hour slower," said the rider to the Belgian TV channel TVOost. The Belgian is set to appear at the Omloop Het Nieuwsblad and this diagnose is not changing his plans at all. "It only bothers me when I put on my glasses. You can compare it with a stuffy nose, so we should not make it more of it than what it actually is."